It's hard to believe it's just over 3 weeks ago now since the Guelph Organic Conference. Still reeling from all the information, rich discussion and buzzing atmosphere, I wanted to share some of my takeaways from this year's workshops. Of the many inspiring women farmers and professionals giving talks over the weekend, Hanna Jacobs of Matchbox Gardens and Victoria Bick from Dundern Castle Gardens were offering the first workshop I attended. They were both speaking passionately about heirloom vegetables – the pros, the cons, the flavour and the fun. One (Hanna) grows for seed and the other (Victoria) grows for the purpose of re-enacting a Victorian garden from the period 1832-1862. Hanna and Victoria listed their favourite heirlooms to grow appropriate for their needs and shared the reasons they believe heirlooms are worth growing for the better flavour, uniqueness, disease resistance and seed-saving ability. Both women have relatively small, extremely productive and diverse gardens and emphasize the importance of minimal disturbance and feeding the soil. This was a theme echoed in other workshops by David Cohlmeyer, who spoke about “optimizing flavour in your market garden and field crops”, Brent Preston & Gillian Flies of the New Farm who spoke on “Green Manure Crops for Vegetable Producers” and Sarah Hargreaves from the EFAO (Ecological Farmers Association of Ontario) who shared “Farmer-led Research Highlights & Tips”. The overall message being, the more you keep the soil covered and undisturbed, the faster, stronger, healthier and tastier your plants grow! Why? Because undisturbed soil has more biological activity (all those little micro organisms that move minerals around and aerate the soil) and soil that is fed a mowed-down green manure/cover crop has more nutrients to give back to the next crop you grow in the same area. An example of the success of this method was given by Brent & Gillian, whose salad greens were 1 week ahead in growth compared with seeds that were planted into tilled ground. The jury is still out however on how to plant into a cover crop or create a nice seed bed with minimum or no tillage so as not to disturb the perfectly balanced soil ecosystem. An area worthy of further exploration, experimentation and research for sure! Which brings me to two other breathtaking lectures – one by Jackie McMillan on how the health of our soil is directly related to the health of our gut! And Mary Beerman who is advocating for the use of native plants to protect the native soil microbiome. The exciting results of the research these speakers brought to the conference highlights the direct correlation between the health of our soil and the health of our own bodies & minds; how fragile and perfectly balance of a system the soil microbiome is; and how conscious we need to be as to how, and where, our food is grown and as stewards of this system! As a whole, worldwide right now, we need to be looking at how we can restore this soil microbiome, restore our native species, and restore our health to prevent chronic diseases and epidemics. It is all connected! Exciting new add-on to your shares! We are very excited to announce that we are now offering Glomalin Organic Natural Skincare products as an add-on option to our CSA shares!! Glomalin products are handmade in Shelburne and we feel that a local, organic and natural product such as this aligns beautifully with our values. We hope you agree! This is an exclusive add-on option for CSA members!! 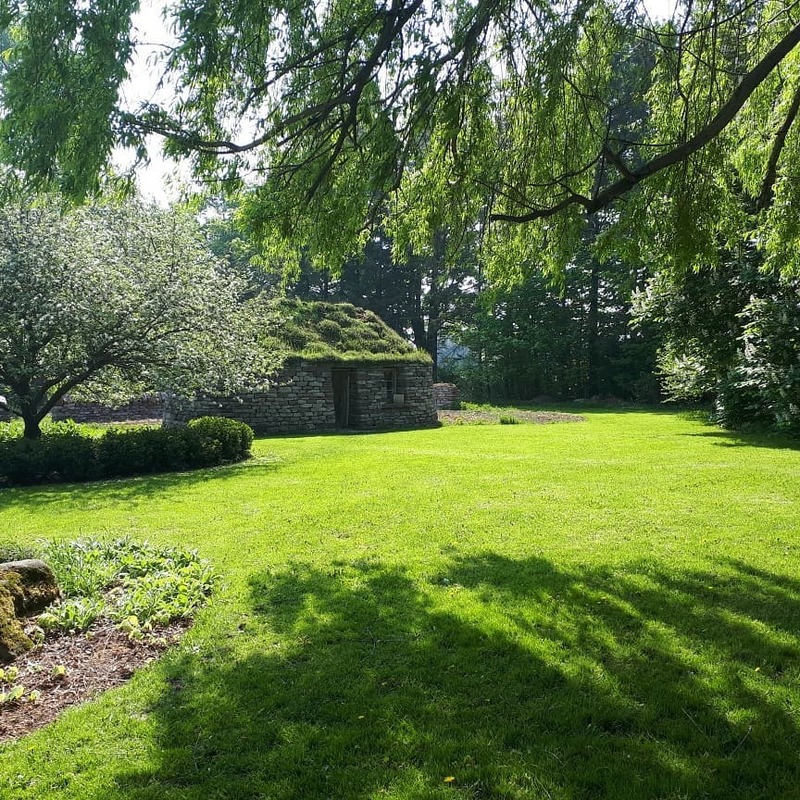 You are invited to join us on Saturday June 23rd from noon to 3pm for a guided tour of the farm and a pot-luck lunch in the "Blackhouse" (Scottish-style stone structure on the property). We hope you can make it out to see where and how our produce is grown as well as meet some of our trusty and supportive CSA members! We are very excited with the launch of our new logo which we feel represents exactly what we do now and in the future! Speaking of future....what do you think of our new website?! We're still doing some tweeking but it's close to complete for now in our eyes. Would love to hear your feedback! Now that we've got our name out there on the world wide web we can get back to doing what we we do best - growing strong seedlings and getting our soil ready for the 2018 season!